The Significance of the Flying Pig! It started in Nenagh, Tipperary. We felt we were going nowhere in terms of work. I was employed with the HSE as a Medical Scientist and Sean was a butcher working in a local shop. We were living in a modest house and the girls were in a crèche all day. We had always talked about opening our own shop… for years. We are real foodies. We did everything except open the shop – we had a blog and practiced our sausage recipes. I suppose we were afraid of doing it because most people would think that it would be a crazy thing to do to give up ‘good’ jobs in a recession. But we didn’t feel we were getting anywhere productively in our work, and we weren’t happy and we wanted something more and there’s nothing like having young children to focus your mind on what’s really right for them also. I spoke to Sean around Christmas time 2013 about ‘THE SHOP’ and I stated categorically that we had to do something and that I wanted to move and do it in 2014. I stated that my new year’s resolution was to open a shop in Castlebar and to be up to our eyeballs in turkeys in 12 months’ time. ‘Pigs will fly’ Sean said. 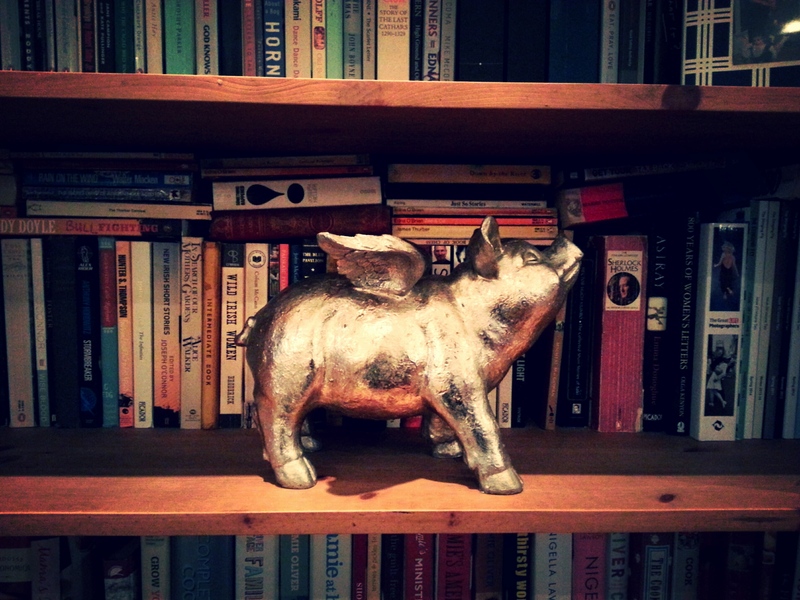 I went shopping for Sean’s Christmas present the week before Christmas, and went into a new shop that had opened in Nenagh (called Twenty-six) and there , inside the door, was a small silver flying pig, which I promptly bought and gave to him on Christmas day. He was still sceptical. We were in Castlebar for New Year’s Eve. It’s Sean’s home town, and we always felt it might be a good place to open our kind of shop. We were driving through the car park on New Year’s Day, and Martin McHale and his son were making a delivery of meat to the back of their shop. We had heard rumours that Martin was thinking of retiring. We plucked up to the courage to drive up and talk to him. It was more than a bit nerve-wracking. He took our number and he put it into his wallet, which Sean said was a good sign. Three weeks later he called. We could lease it if we still wanted it. The shop was….old school. It needed work to renovate it to how we wanted it and we had no money. It took some convincing to get the loan from the bank. We barely got enough to do the work piece meal. But we were granted the loan and Sean started in the shop on Friday the 4th of April. I was supposed to stay on in Nenagh working in the HSE. But Sean and I never worked well apart. So I handed in my notice on Monday 7th of April. Renovation work started in the evenings and on weekends, while we kept the shop open and worked on getting our suppliers right and building a few customers. We are a whole animal butcher shop. We buy in whole animals, age the meat appropriately on the bone, and butcher it in the traditional way. We’re big into local. We wanted to do it right. The shop was finally finished in October and we had our launch on the 13th. It was a great night. There were a few surprising things along the way: we were regional finalists for the Bank of Ireland entrepreneurial start-up of the year awards in the food and drink category. We didn’t get any further than that, but it was such a boost in July to get that recognition. We are shortlisted for Gradam Gnó awarded by Gnó Mhaigh Eo, and the award ceremony is in January 2015 – so fingers crossed. The real boost came at the end of November when we received notice from John and Sally McKenna that we are to be included in the 2015 McKenna guide – we are so thrilled at this as we have so much respect for the McKennas and feel that their guide celebrates everything that we are trying to achieve. As for the flying pig – we incorporated it into our logo as a reminder to always go for it, regardless.